Simply add this mustard and make your menu offerings pop with a tangy, spicy flavor your customers won't be able to resist! This gold 'n spicy mustard from Admiration features a rich, golden brown color and includes tart vinegar, zesty mustard seed, and a blend of exotic spices. Mustard is an essential condiment, and this perfected recipe from Admiration takes mustard to the next level of flavor! Admiration uses the finest grade mustard seeds to bring you the best product possible. This gold 'n spicy mustard can be compared to a Dijon-type mustard. Unlike yellow mustard, it has a sharper and stronger taste. Its hot flavor brings out the natural spice of the mustard seed. Perfect for cold meats and marinades, you'll also be able to use it to top traditional menu offerings, like hot dogs, deli sandwiches, and pretzels. Looking to kick up the flavor in your dishes? The creamy consistency and cool, crisp taste of mustard is sure to spice up any salad or sandwich. This gold 'n spicy mustard adds an extra kick fiery flavor-without the extra cost. These one gallon containers from Admiration come at a great value! Smooth in texture and taste, and low in fat, carbohydrates, and cholesterol, this mustard is the perfect condiment of choice for even your most health-conscious patrons. The Admiration Gold N Spicy Mustard is comparable to Golden's Mustard. It has a nice zesty taste at an inexpensive price. This is great for sandwiches or any as an add in for salads. Highly recommended for any residential and commercial kitchen. A nice value gallon container of gold n spicy mustard that is a nice variation on mustard sauce. The mustard is great for dipping chicken fingers and putting on sausage dogs. We've ordered Admiration Gold N Spicy mustard numerous times because our customers love it with our German pretzels and sausages. I've had several customers ask if they could buy some because they like it so much! I like that the fact that this is a natural mustard without any preservatives or junk and the price is right. I really love this admiration product. It adds a great spicy kick to whatever I am adding it on or into! Great for potato salad or even just a hot dog topping. I love this spicy mustard! It is perfect for making a creamy sauce for serving with crab cakes! I personally love enjoying it with fresh hot pretzels!! Great mustard, the quality and taste is great and it works really well on our sandwiches, just the kick the sandwich needs. Great quality for the price. 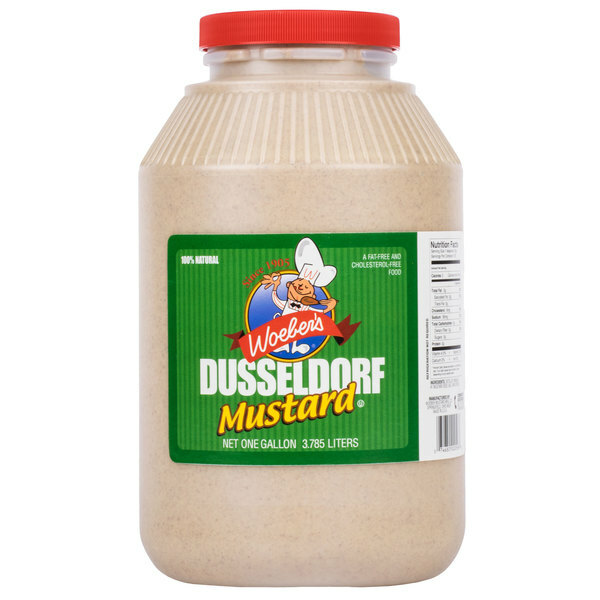 Check out Woeber's 1 gallon dusseldorf mustard instead! This classic blend has a medium brown color and a finely ground texture with some visible bits of mustard seed. 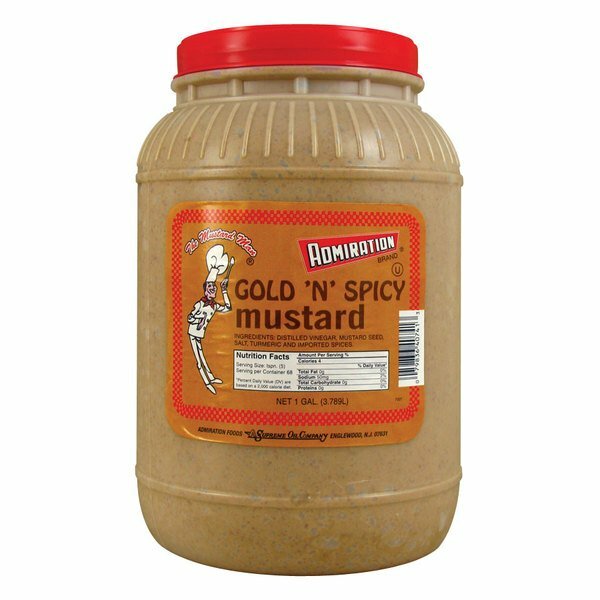 This is a great alternative option as Admiration gold 'n spicy mustard has been discontinued by the manufacturer.